After my most recent birthday, I discovered something new about my body: occasionally when I squat down, my knees will give a little pop. That didn’t happen before. What’s also new are the little lines and crinkles underneath my eyes that definitely weren’t there before. I’ve always been a fan of sleeping, but now if I don’t get plenty of rest, my eyes become so bloodshot, I start to look a little like those white rabbits with the red eyes. I sound like I’m complaining, but I find this to be super exciting! I’m not being sarcastic. No, really. Aging is of course a natural and, contrary to what the beauty industry and what certain health food companies claim, it is also a completely unavoidable process. It’s a process that I’ve been honestly looking forward to since around birth, when I was brought into this world a squalling infant with a full head of hair and the personality and disposition of a 40-year-old. If anything, the older I get, the more I relish the time spent in my body and the more excited I am to be closer to my “true” age. Despite my own enthusiasm, aging (especially for women and femmes) is normally not treated with such a casual and welcome attitude. It’s met with rules and guidelines of how to behave, how to dress, and how to be. Clothing is often used as a tool of self-expression and individuality – a chance for you to show off what it means to be you. However, the older you get, the more you’re expected to tone it down and dress more conservatively. Fortunately, there are people around like Ari Seth Cohen, who started a blog dedicated solely to seniors with style. The focus is mainly on women over a “certain age,” though there are a few dapper gentlemen here and there. I stumbled across his first book, Advanced Style, and it might sound hyperbolic to say that my life has been forever changed, but it’s true. My life has been forever changed. Inside I found stunning color photographs of women I not only admired; I wanted to become them. Unless you’re Betty White, who is a magical unicorn who can do whatever the heck she wants, women are so often shoved to the side and told to just blend in–color and sparkle and bold patterns are only for the youth. Each of the people featured in Advanced Style defy these conventions in the most glorious of ways. Signature orange hair and long, fluttery neon eyelashes to match? What a knockout. Dark, vampy lipstick and a thing for scarves or chunky jewelry? Oh my goodness. Here are all women who couldn’t care less what the unspoken rules and loud internet trolls have to say. Shortly after the book was released, along came a documentary that follows some of the popular favorites of the book and blog. The documentary allows viewers to spend more time with some of the extravagant and fearless women Cohen has documented on his blog and in his book. Getting to know Illona Royce Smithkin (those eyelashes!) a little better was such a treat. The different personalities of the women shine through in the documentary, in the most touching (and heartbreaking) ways. No matter what, life is celebrated. 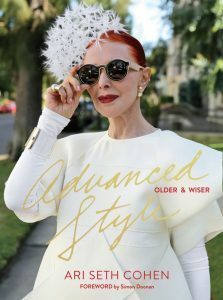 Luckily for all of us, there is now a second book – Advanced Style: Older & Wiser, which has more than 260 pages of the best street style images you will ever come across, and more information on the people featured. For those who were left wanting more after the first book and the documentary… This will make you happy! Ari Seth Cohen’s love and affection for the people he captures on film comes across in the photography, and you will fall for them just as hard. 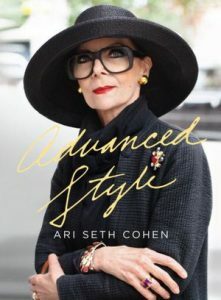 Perhaps it’s because, like Ari, I had a close relationship with a grandmother I dearly miss, but everything in the Advanced Style publishing family fills me with so much inspiration and positivity. The women are all so unique, and yet their voices all echo the same sentiment: be yourself, no matter what age, no matter what life experiences. This can be applied to how old you are, but it can also be applied to your gender identity, belief system, body size, and every other factor that makes you who you are. If anything, this has encouraged me to truly embrace my own style and my own ways of being, because if this wonderful group of people is bold and brave enough to stand out when they have been told to stay silent – I can do the same. So if you catch me wearing light up sneakers and kitty cat sweaters a la Kimmy Schmidt and a Linda Rodini-inspired purple pout, don’t be surprised. I’m just playing around a little, so that in 50 years when I’m featured on Advanced Style, I will have finally perfected my look. Who knows? Maybe I’ll have orange hair, too. -Kimberly Lopez is a Readers’ Services Assistant at Lawrence Public Library.